Several reports of persecution against Christians from around the globe have emerged this week, including an update on violence against Christians in Nigeria, the deadly 2010 bombing of an Iraqi church, attacks against Christians in India and a bombing of a missionary Bible college in Sudan. Kashmir - Muslim leader Syed Ali Shah Geelani spoke out Saturday in support of four Christian missionaries after a Sharia court last week issued a decree seeking their expulsion from the state, Christian Today reported. Despite the support, the missionaries were expelled Friday. Nigeria – Pastor Enoch Adejare Adeboye, who is the General Overseer of the Redeemed Christian Church of God (RCCG) in Nigeria, posted a statement on his Facebook page Saturday in which he presumably warns Islamist sect Boko Haram to stop attacking Christians, their homes and churches, or expect to face the consequences. "We are not allowed to burn mosques or kill people of other religious beliefs but [the] Bible says we are allowed [to defend] ourselves/churches/homes," the statement reads. Nigerian Christians, who have been long targeted by Muslim extremists, especially in the northeast of the country, have reportedly begun to retaliate by occasionally attacking Muslim establishments. Indonesia – Indonesian Christians held a prayer vigil in Jakarta on Sunday, urging President Susilo Bambang Yudhoyono to help stop the intimidation practiced by Muslim extremists, Agence France-Presse reported. About 200 people, mostly members of the Taman Yasmin Indonesian Christian Church, prayed and sang hymns outside the state palace. China – Five priests from an "underground" church were arrested by Chinese authorities without any explanation Monday during a private meeting in a private house, reported UCA news. Meanwhile, on Thursday, ChinaAid, a human rights organization, released its annual report on acts of persecution reportedly performed by the Chinese communist government on Christians and churches in mainland China in 2011. Among other disquieting statistics indicating an increase in crackdowns on house churches, the report shows a 131.8 percent increase in the number of Christians detained for their religious beliefs in the country. Also in China, the trial of a longtime political dissident and baptized Christian, Zhu Yufu, took place Tuesday in China, amid allegations that witnesses were restrained form participating in it. Zhu, 59, has previously served seven years in prison (from 1999 to 2006) for his role in founding the China Democratic Party, according to Human Rights in China (HRIC). The Hangzhou Municipal Intermediate People's Court tried him Tuesday for "inciting subversion of state power," according to HRIC, but failed to hand down a verdict, leaving the disident's future still in question. Pakistan - A judge Monday denied bail to a young Christian man charged with desecrating a Quran under Pakistan's controversial blasphemy laws, despite the lack of evidence, Compass Direct News reported. The 23-year-old was reportedly arrested on Dec. 5 over a shaky allegation from his neighbor that the young man had burned pages of the Quran in order to prepare tea. Indonesia – An Indonesian church said Monday that one of its members has been unjustly named a suspect by police for allegedly assaulting the local police chief during a melee between authorities and church members in October near Jakarta, reported The Jakarta Globe. The church, which claims numerous acts of persecution from the government, has reportedly had accused the same police chief of using violence to obstruct a religious ceremony. Sudan - A Bible college in Sudan functioning under Franklin Graham's missionary ministry, Samaritan's Purse, was bombed Wednesday and the ministry alleges the attack was launched by the Sudanese air force, as part of violent clashed between the mostly Islamic government in Khartoum and the mostly Christian, and newly seceded, south. Algeria - Armed men raided the Protestant Church of Ouargla in eastern Algeria on Wednesday, tearing down the church's gate and damaging the iron crucifix on the church's roof, according to International Christian Concern (ICC). The pastor told ICC that he has been repeatedly threatened and attacked since his ordination in 2007. In the summer of 2009, his wife was beaten and seriously injured by a group of unknown men, and in late 2011, heaps of trash were thrown over the compound walls while an angry mob shouted death threats at the pastor, the minister told the Christian advocacy group. 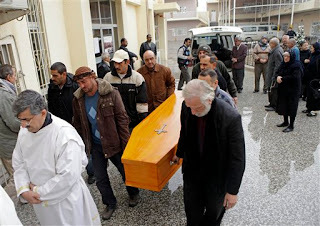 Algerian Christans are often target of attacks from militant Muslims. Iraq – Three Islamist extremists convicted in the attack on Our Lady of Salvation church in Baghdad that killed over 50 congregants and wounded more than 60 others in Oct. 2010 were sentenced to death by Iraq's highest court Thursday. Saudi Arabia - The U.S. Commission on International Religious Freedom (USCIRF), a governmental body, called Thursday for the immediate release of 35 Ethiopian Christians who have been detained by Saudi Arabian police since Dec. 15, allegedly for participating in a private religious gathering. Iran - A report has emerged this week about the Iranian Revolutionary Court sentencing a female Iranian Christian convert to two years in prison earlier this month. The official reasons given by the court were reportedly related to the woman betraying Islam, but media reports have clearly suggested that the conviction is an act of state persecution against a Christian. India - Sajan K George, president of the Global Council of Indian Christians (GCIC), spoke out against violence against Christians Thursday after the number of attacks increased in late January. Acts of violence against Christians reportedly accelerated after Christmas and New Year's. Among recent incidents was an attack on a Pentecostal clergyman by a group of ultra-nationalist Hindu extremists and a desecration of a monumental Christian cemetery, as reported by Asia News.